Finding the perfect audition monologue is such a pain in the BOOTY! I remember plopping myself at the Drama Book Shop in NYC and scanning play after play after play. Here's a few guidelines to help you find a great monologue for you! 1. MAKE SURE YOUR AUDITION MONOLOGUE IS FROM A PUBLISHED PLAY! Some monologues say they are published because someone wrote them and put them in a monologue book. This is not the same thing as a monologue from a published play. AND now, in the great world of DIY, even plays can be self published. So be careful not to select something from a random piece of text unless you really really really connect with it. 2. 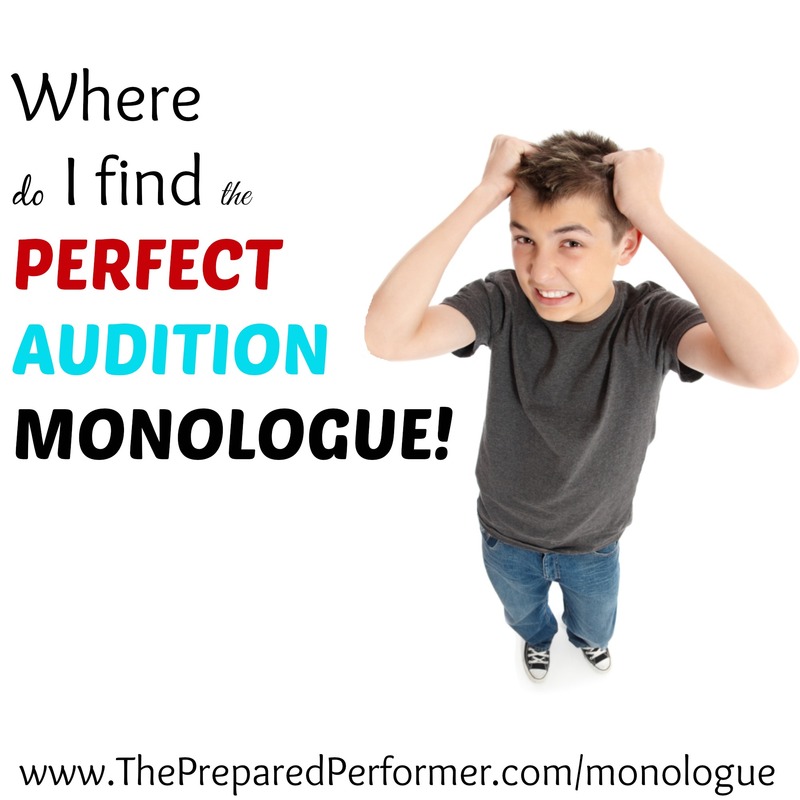 MAKE SURE YOU CONNECT WITH YOUR AUDITION MONOLOGUE! Don't pick something because you think it is funny or touching if you can't find a way to connect to your piece. One of the first steps in my e-book 6 STEPS TO ACTING WITH LESS EFFORT is to discover how YOU connect with the piece. What about the monologue can you translate into your own life. If it's about falling madly in love, you must find a time in your life where you have fell madly in love – even if it was just with a dog or a cookie recipe. Answer the questions in the awesome Character Building Worksheet that Jes DeGroot created for us, click the button below to download. Know you your character is speaking to. Know what your character wants ie: your character's OBJECTIVE. All of our characters are motivated by some sort of want. Discover what it is an what TACTICS your character uses to get what he/she wants. Do your BEAT WORK. If you don't know what that is… download the 6 STEPS TO ACTING WITH LESS EFFORT and discover the magic of working your beats. Click Here to Download 6 Steps to Acting with Less Effort. Ready to start your search for the perfect monologue? We've done the work for you and picked out 10 Audition Monologues that will help get your started! Subscribe to download these lesser known monologues so that you can head into your next audition with confidence as a prepared performer. Success! Now check your email to confirm your subscription and download your new monologues. If you don't connect with any of the monologues listed in our collection, here's some great books and websites that might help get you on the right path towards finding a monologue that is perfect for you. I think it's a really great idea to invest in one or two of the monologue books listed below. They include only monologues from substantial plays, and they aren't the same monologues that have been published all over the internet. So many people use the same 3 or 4 monologues. These books will give you loads to choose from. PS – The books listed here are part of the Amazon Affiliate program. We will get a small commission if you purchase these items with no extra cost to you : ) BUT!!! I promise that we are only recommending items that we love.